Simple prosthetics and a set of costume contacts can elevate your Halloween look or convention cosplay. 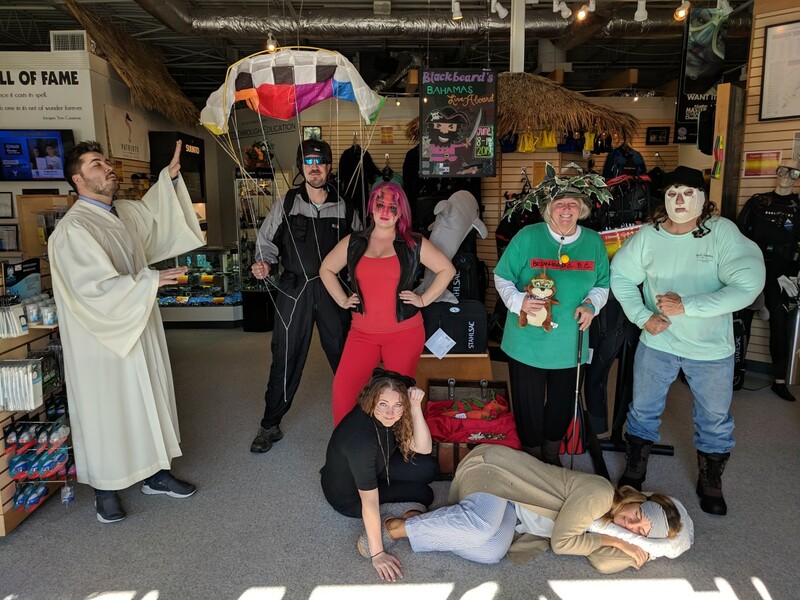 I did not plan ahead for Halloween at work, and the night before I was trying to figure out what I could do with things I already had in a limited amount of time. 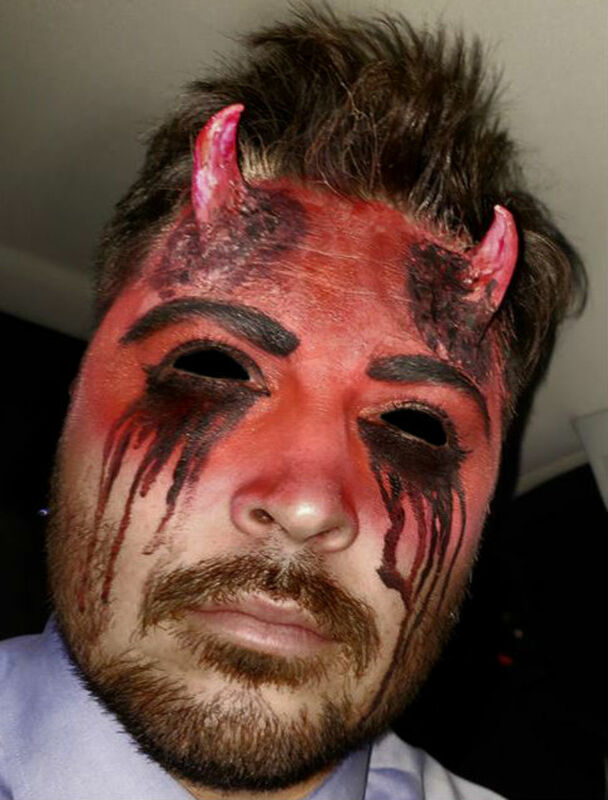 With what I found in my closet, I was able to throw together a simple devil costume for work. I used red pants, a red tank top, black leather ankle boots, and a black leather vest I made out of a jacket from Goodwill for a Tron costume a few years back. 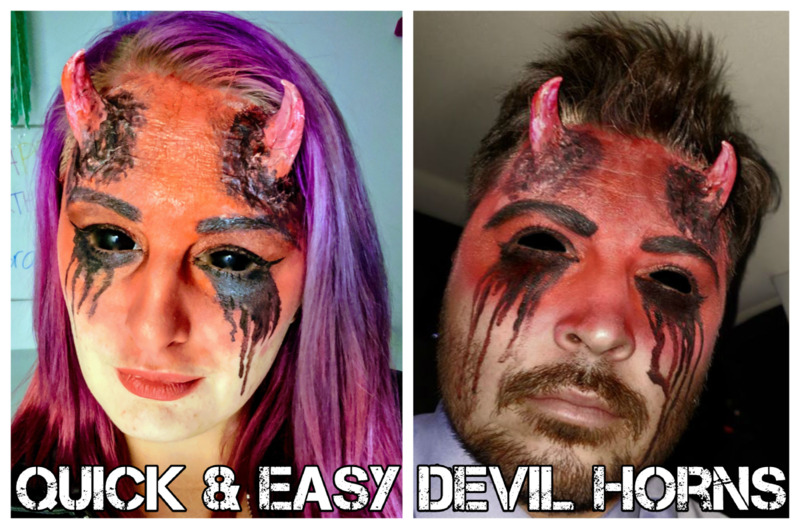 I was able to make and apply these horns without spending any additional money, but I am putting a price list together so that you know what I would have spent. This look took me about two hours of cumulative time to complete. I only say two hours because of the oven time needed for making the horns. 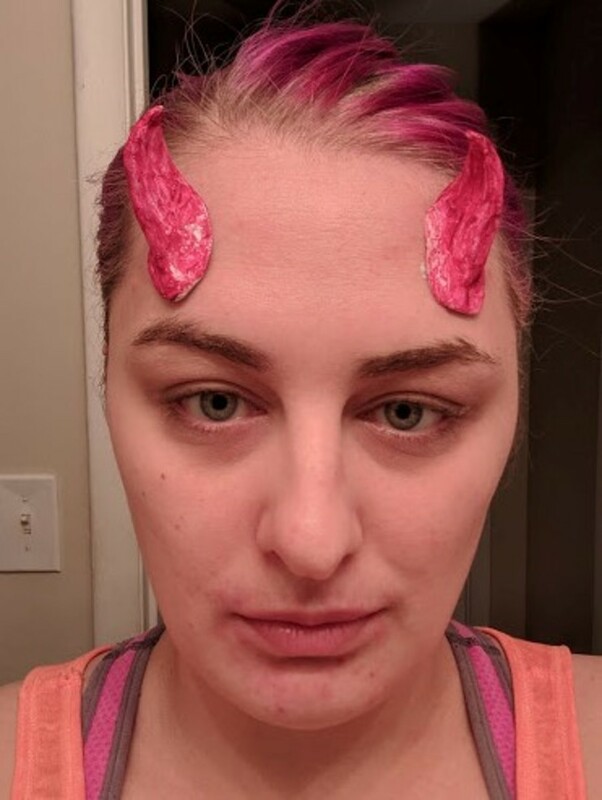 If you make the horns ahead of time (I made mine the night before), the actual getting ready process will only take 30-45 minutes. You can probably tell this from the list that there are many variations of how you can do this. Find your own supplies that are within your own budget. The biggest thing from this list that I recommend you stick with is the prosthetic adhesive and the air dry clay. Everything else can be substituted with something that you might already have at home. I already owned all of these products and did not purchase them specifically for this costume. If you like costuming and can invest in a good pair of sclera contacts, definitely do it. The prices vary greatly based on where you purchase them. I got mine from Sclera-Lenses.com, the cheapest pair I could find from a reputable European company. I've worn them several times since purchasing, and they are comfortable. Take the Crayola Air Dry clay and mold two horn shapes out of it. Use a little water if needed to smooth out any imperfections. Make sure they aren't too large because they will take too long to dry. Let them sit out in open air for a few days to dry. If you're on a time crunch, turn the oven on the lowest setting. Place the horns on a sheet of tin foil and bake for 30–40 minutes, and let them stand in the oven overnight to cool and dry out completely. 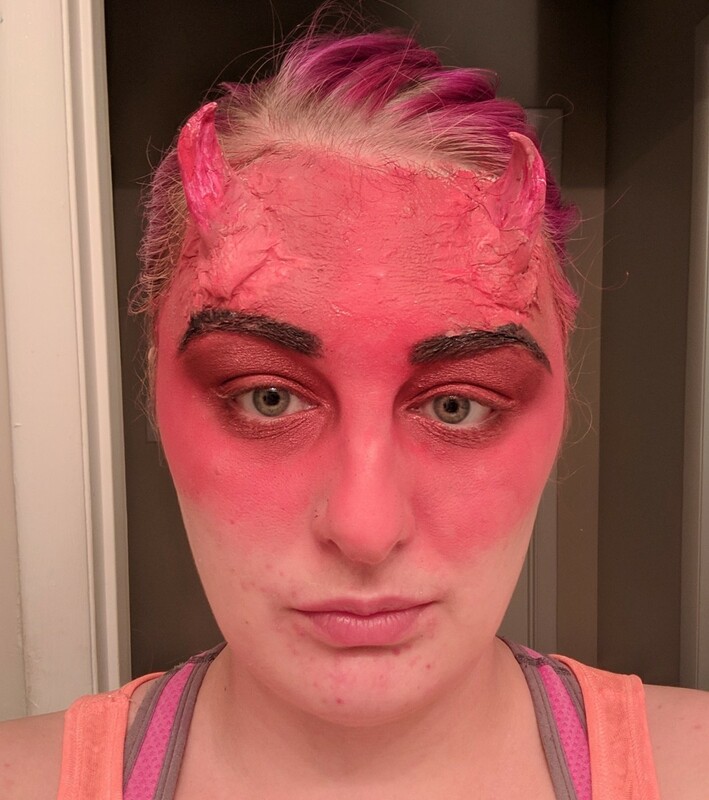 I was crunched for time and had limited supplies, so I actually used my NYX matte lipstick to paint my horns red. If you have acrylic paint, I would recommend painting with that. Let dry. Once dry, you can begin with the prosthetic process. Using a cheap paintbrush, dip into the adhesive and paint a little bit of adhesive onto the part of the horn that will stick to your forehead. Put a dot of adhesive on your forehead where you want each horn to go. Let sit for a few seconds to get tacky, then attach to your forehead. Rinse your paintbrush immediately, so the adhesive doesn't ruin it. Cut circles from toilet paper that are roughly two inches in diameter. Poke a hole in the middle of each circle, and gently rip around the hole, being careful not to rip the circle. Slide the toilet paper onto the horns you've attached to your forehead by slipping the horn through the hole you ripped in the middle of the toilet paper. Take your paintbrush and dip in liquid latex (not adhesive). Paint over the toilet paper like paper mache until it looks the way you want it to. The latex/toilet paper combo helps blend the edges of your prosthetics by making it look like they popped out of your skin. If you're not happy with the first layer of toilet paper, add another layer to get your desired peely-skin level. As a side note, the adhesive I use, Kryolan Prosthetic Adhesive #1 (also branded as Pros-Aide), is pretty much amazing. I bought it last year from Norcostco in Atlanta, and it's been a lifesaver. 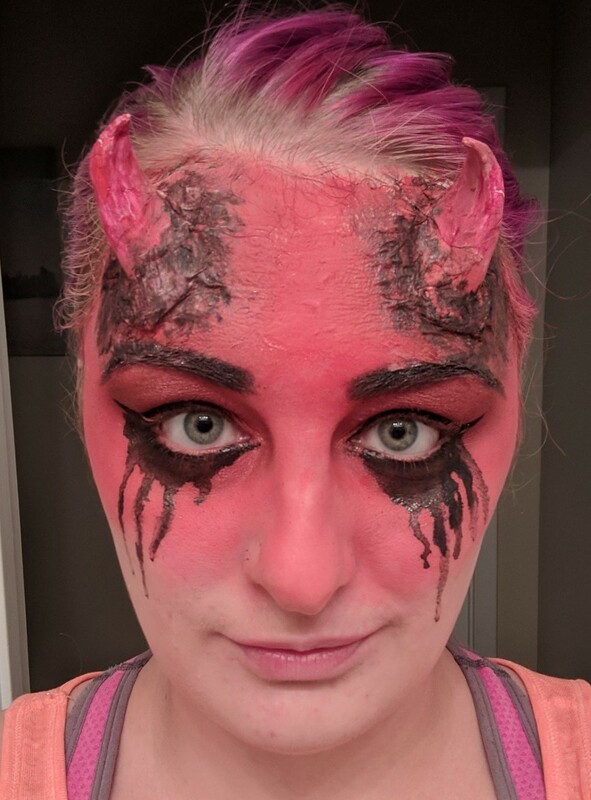 When I wore the finished horns to work, they stayed in place for a full 10 hours before I took them off, and I fully credit that to how well this adhesive works because it was a hot day and I was definitely sweating a little bit. The adhesive is relatively easy to remove, but if you are using more than a little bit for your cosplay, I recommend purchasing the remover that is sold to help take it off. If you're only using a little bit, it should scrub off pretty easily with an exfoliating face wash. If you're not planning to wear contact lenses, skip this step. If you are wearing them, go ahead and put them in now. You always want to apply contact lenses, especially scleras, before makeup because if you wait till after your eyes will water and ruin all of your work. You'll also get tons of makeup on your contacts which will then transfer to your eyes and be really uncomfortable. I was an idiot and forgot to put them in till I was almost done, so don't do what I did. 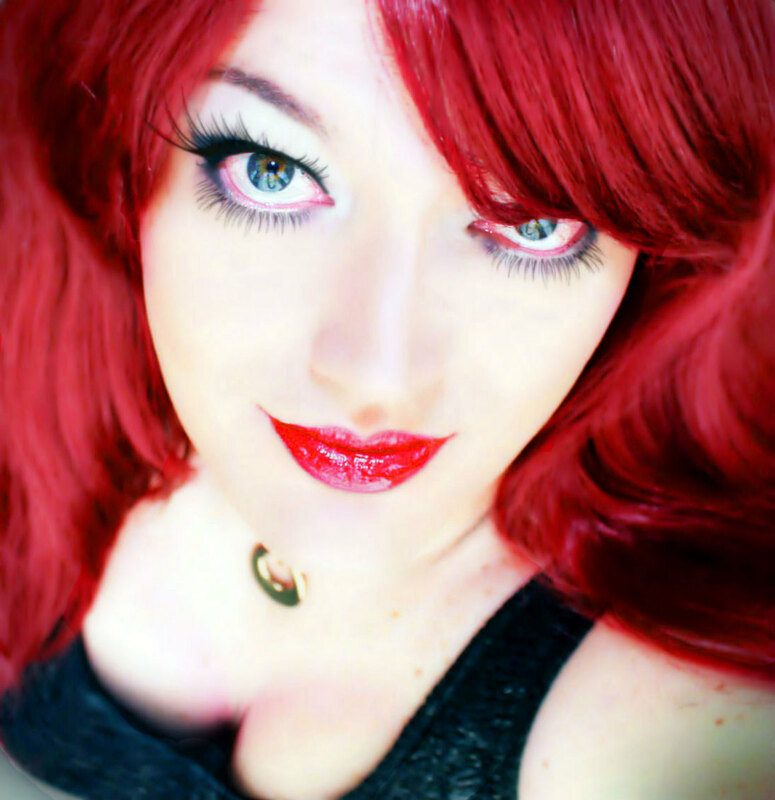 As I mentioned before, I got my lenses from www.Sclera-Lenses.com. There are many places online to shop for scleras, and there are many different price ranges for them depending on who you get them from. It is possible to get them with a prescription if you need it, so make sure you do a lot of research before selecting the right pair for you. 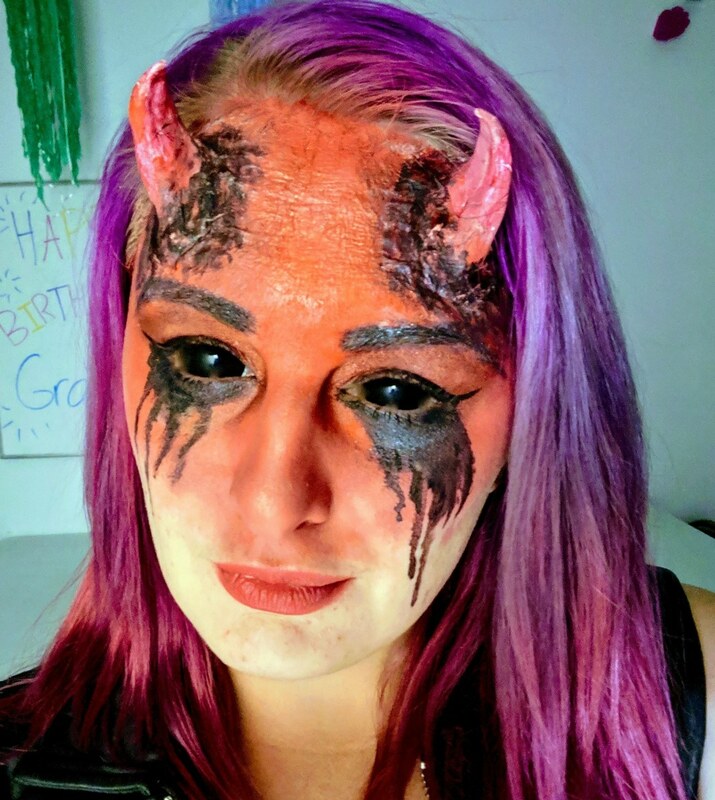 Costume contacts that are not prescribed by a licensed optometrist or ophthalmologist are not recommended by the FDA, and it is actually against the law to buy or sell them without a prescription in some areas. Begin by using your foundation on a beauty blender to blend the toilet paper into your skin. It doesn't really matter if the foundation color matches your skin very well because you will be painting over it anyway. The full coverage foundation helps hide that you just glued toilet paper on your face on purpose. Apply red face paint to your beauty blender and dab onto your forehead, cheeks, nose, and eyes. You can cover your whole face, but I did mask style and stopped at my nose and cheekbones. The red face paint will act as a base for the rest of your makeup. Using your fluffy eyeshadow brush, apply a dark metallic red eyeshadow to your eyelids, from the lashline to the crease. 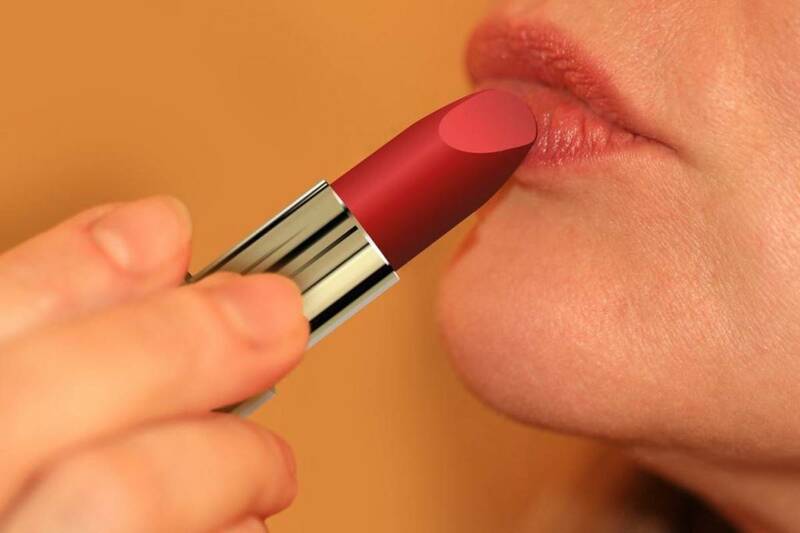 Blend out the edges using a matte red shade. Using the fluffy define brush from the Eco Tools Define and Highlight brush set (or something similar), Apply matte red eyeshadow powder to all visible areas that you applied the red cream base to. This should provide more coverage and seal in the red paint. Prepare your black face paint. If you're using the water activated face paint, I recommended, have a cup with a little bit of water ready. Dip your angled liner brush into the water, and let a few drops of water from the brush drop into the black paint pan. Swirl the brush around, and the makeup should start to cling to your brush like paint. Fill in your eyebrows. I made mine angular to go with the devil theme. Dab the brush around the horns. There is no art or exact science to this. You are just adding dimension. I think it makes the skin look diseased. 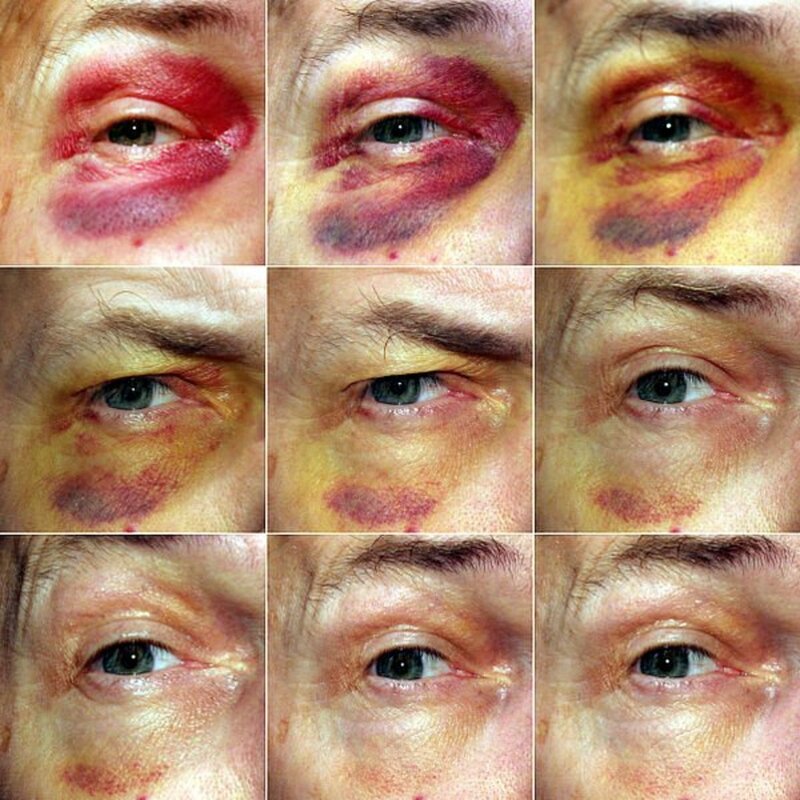 When the area around the horn looks diseased enough to you, stop and move on to the next horn. Add winged eyeliner to the top of your eyelid using the black face paint. I don't care if you're a guy or girl, the winged liner looks awesome. To create the black tears look, add extra water to your face paint. Then draw a thick black line under your eye. You'll need to begin a "track" on the line where you want the tears to fall, so gently draw very short tracks with the paint. Get a drop of water onto your brush and drop it onto a track. Let the water fall naturally. If it doesn't want to move, add another drop of water or shake your head gently to make it fall. Repeat this step until you have the desired number of tear tracks. If some of them are a little too faded, carefully add more paint to each track to darken them. Apply mascara to your lashes. You could even put on fake lashes if you want. Using the highlighter brush, apply a metallic red or pink highlighter to your cheekbones if desired. Apply fake blood around horns if desired. Adorn the bottom half of your face with normal makeup, if you want to. Now you have a simple, go-to Halloween costume ready to go!